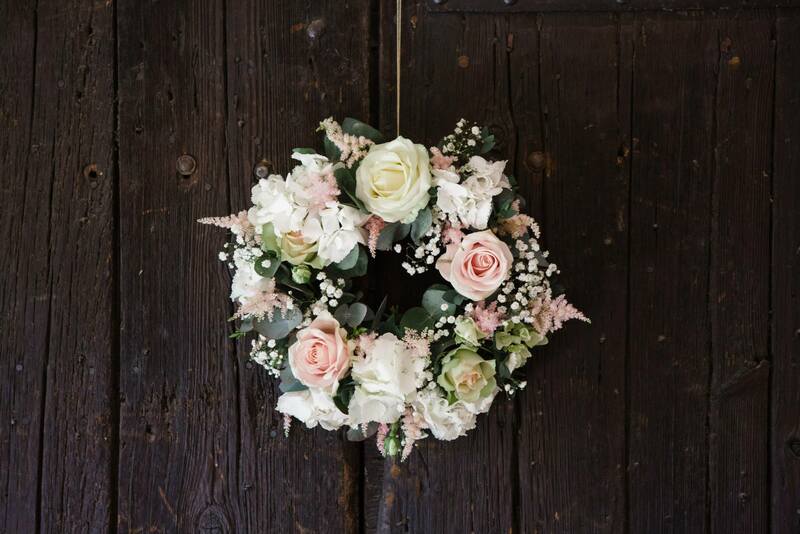 Florence and Russell's fabulous wedding flowers at Caswell House, Oxfordshire - Joanna Carter Wedding Flowers | Oxford, Oxfordshire, Berkshire, Buckinghamshire and London. 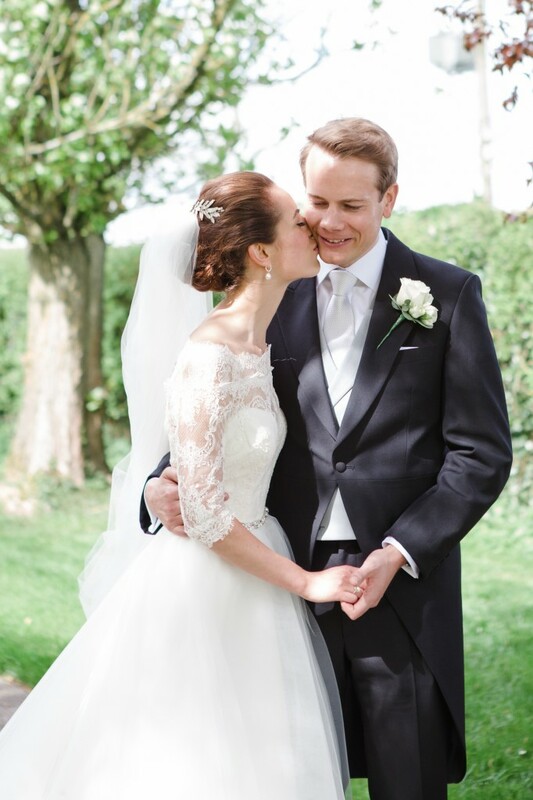 Florence and Russell got married at Caswell House, a stunning Cotswold stone barn set in elegant gardens and one of our favourite venues to work at. 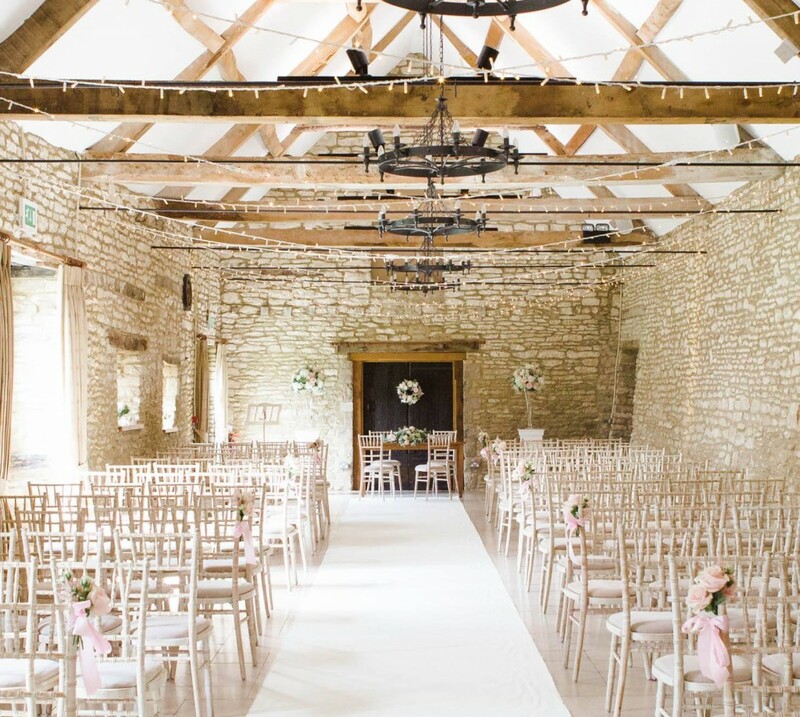 It is a beautiful mix of old and new, with wonderful old beams and high ceilings which flood the venue with light. 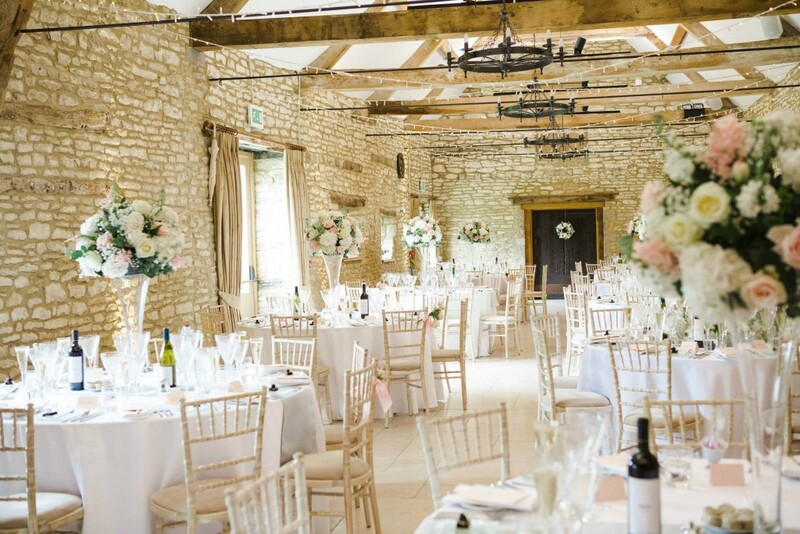 Florence chose a mix of soft pink and ivory flowers and filled every bit of the venue with flowers so that each area of the Barn looked absolutely stunning. 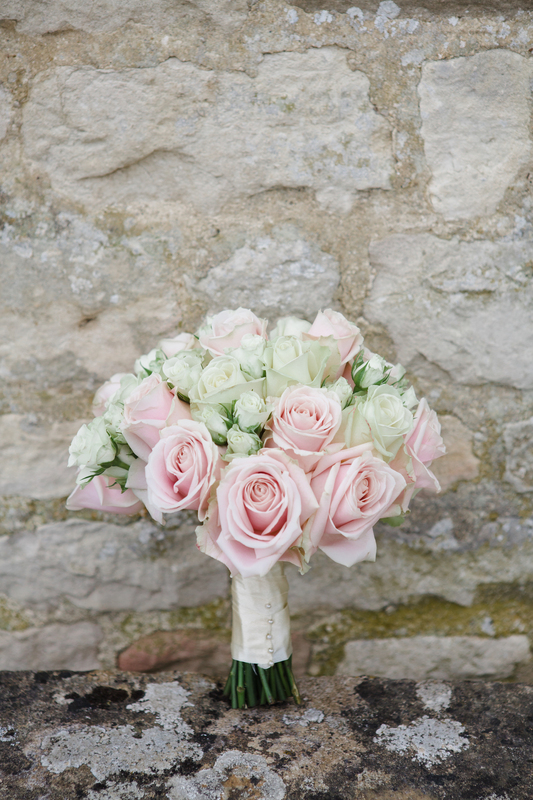 Florence chose a hand tied bouquet of mixed roses and spray roses in ivory and soft pink. 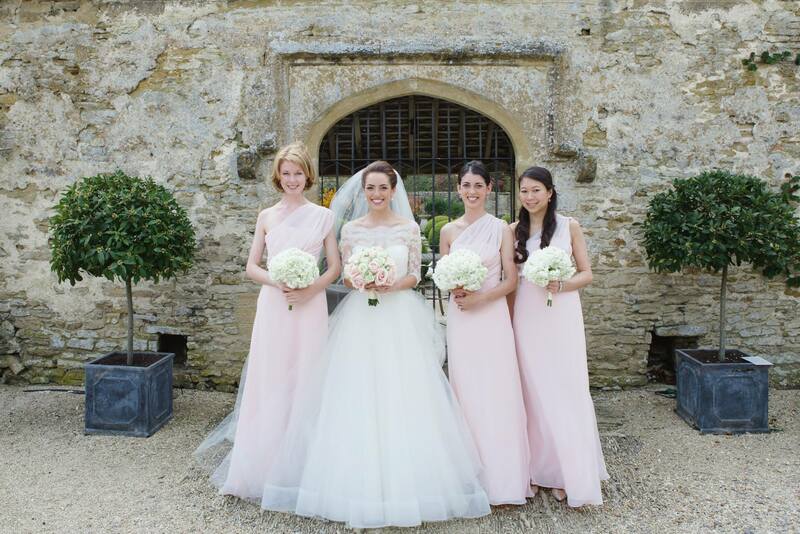 The bridesmaids carried simple pretty bouquets of white hydrangea which complemented their pale pink dresses perfectly. 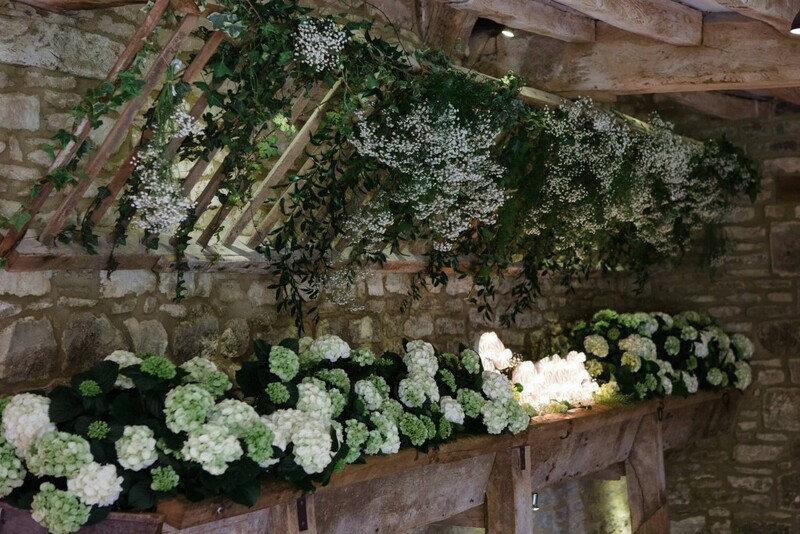 In the main barn we decorated the ceremony area with tall clear glass flute vases on bespoke wooden plinths topped with an arrangement of hydrangea and roses. 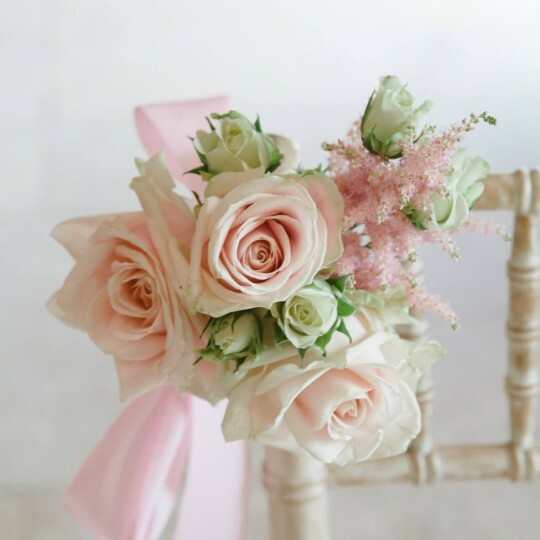 We placed a wreath on the door immediately behind the registrars table and tied small posies on to the chairs in the aisle to act as pew ends. 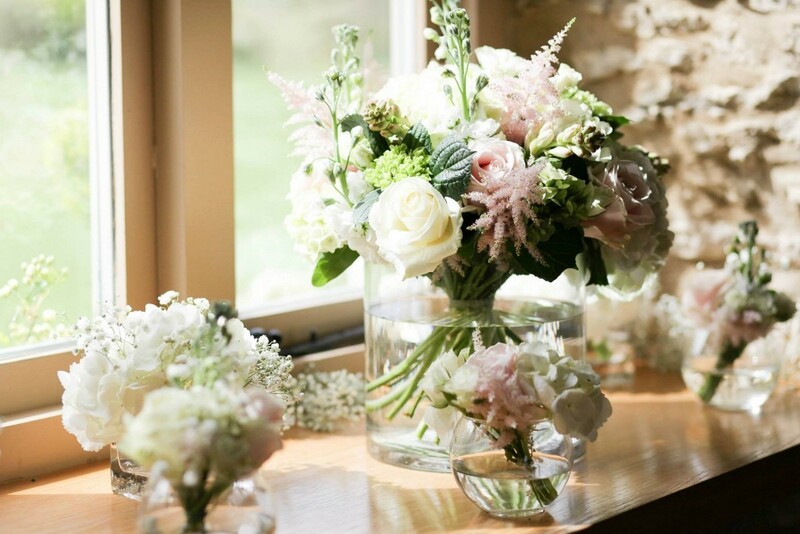 The room was finished off with small vases of flowers on the window sills. It made the perfect backdrop for signing the register following the ceremony. 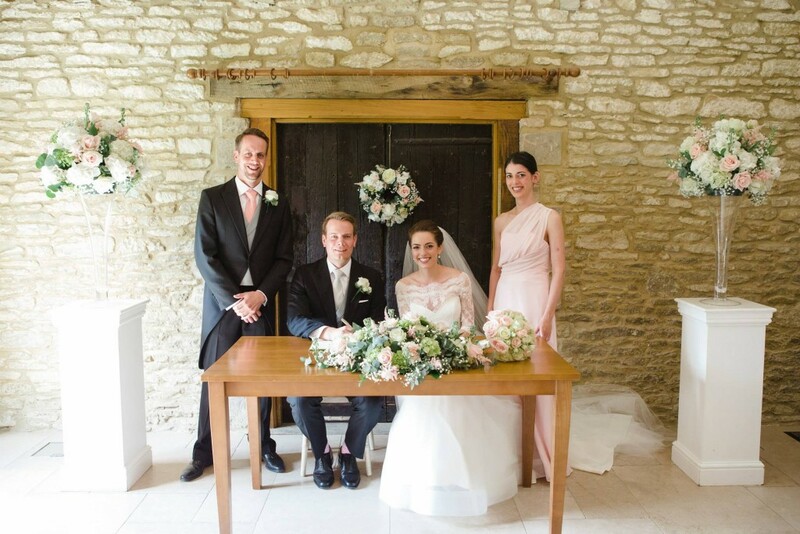 The tall vases were moved to two of the guest tables following the ceremony and the piece on the registrars table was moved to the top table to sit in front of Florence and Russell’s places. At the back of the main barn is a stunning old wooden hay byre. 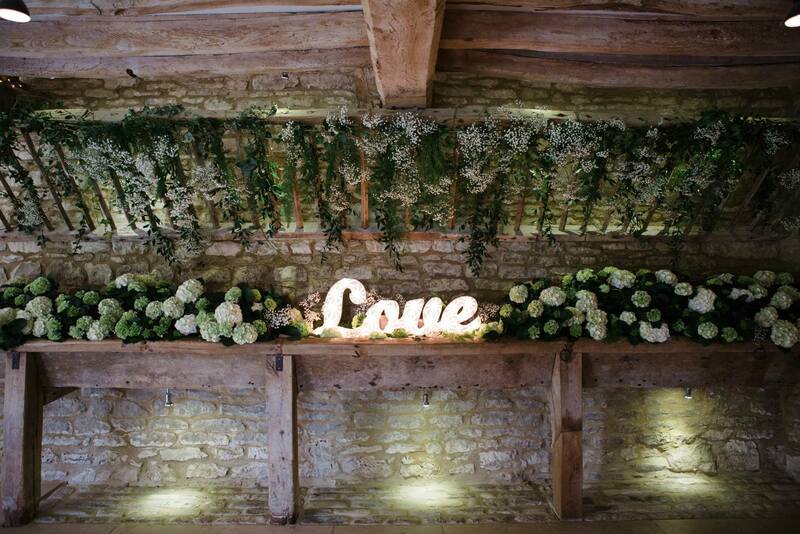 To decorate this area we filled it with hydrangea plants which Florence and Russell could then give to both their parents to take home and plant in their gardens as a momento from the wedding. In the middle of the plants Florence placed an illuminated LOVE sign which looked amazing. Above the plants were trails of ivy and clusters of white gypsophila. So pretty!! 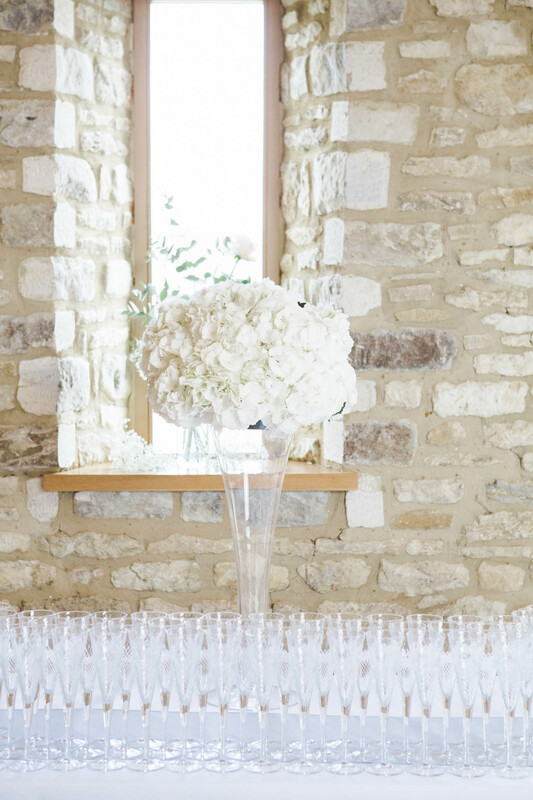 For the drinks reception in the entrance barn we placed further tall flute vases full of white hydrangea on to tables and added more small vases to the window sills. 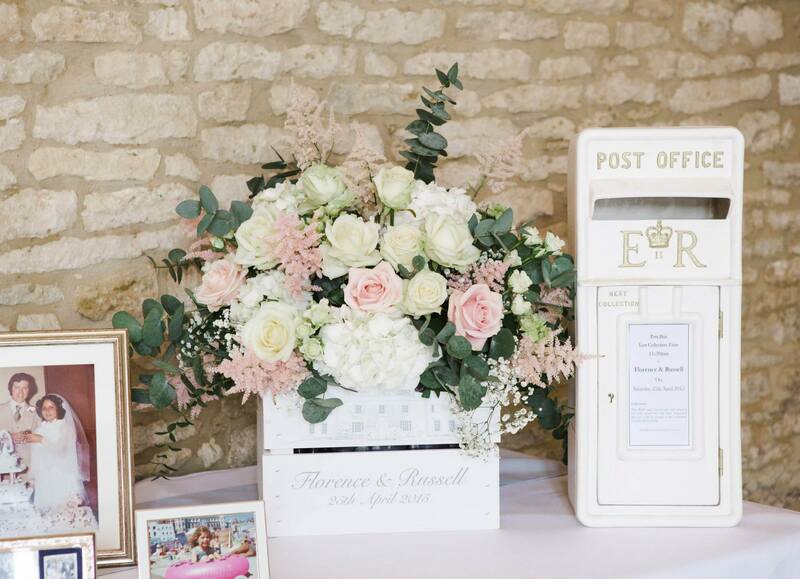 Guests placed cards and notes to the bride and groom in a postbox in the main hall next to lovely bespoke apple crate which was a gift from Russell’s brother and had been personalised with the date and venue for the wedding. 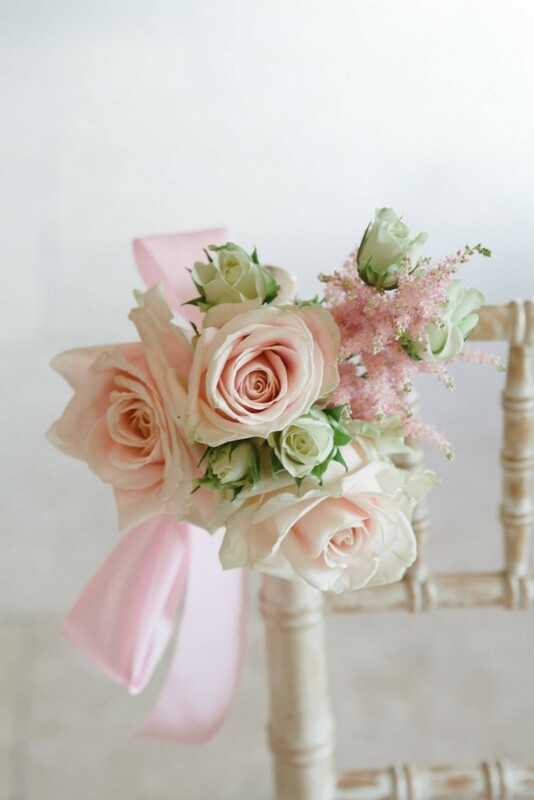 We filled this with a lovely mix of pink and white flowers from throughout the day and placed it next to the large mirrored table plan which the venue supply. After the drinks reception guests then went back in to the main barn which had been transformed ready for the wedding breakfast. Each table had a tall clear glass flute vases full of hydrangea, roses, stocks, gypsophila and eucalyptus foliage. 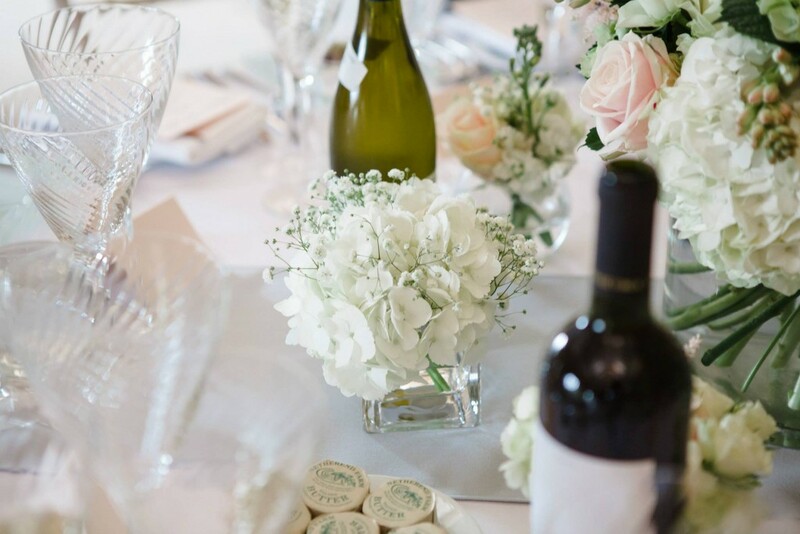 At the base of each tall vase were tiny assorted vases filled with a mix of pink and white flowers to add colour to the tables. Thank you Florence and Russell for letting us be part of your special day. We really enjoyed transforming Caswell House and hope you loved the end result as much as we did. 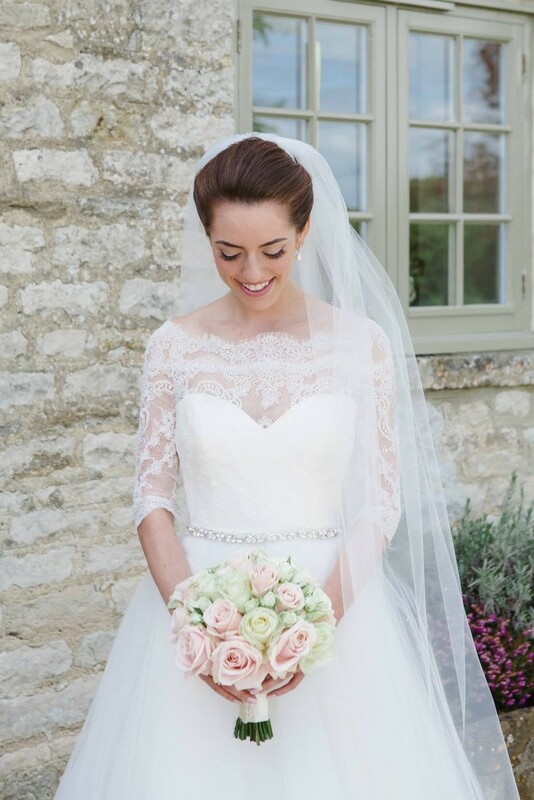 Thank you too to the lovely Lucy Davenport for her brilliant photography. 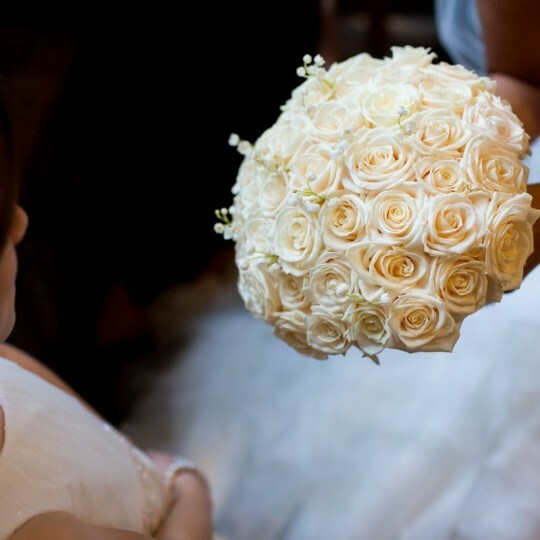 Another fabulous wedding we have worked on together and as ever some stunning photos as a result.